Facebook have been ramming friendship down our throats for quite a long time now. As nice as it is to be reminded of a particular friendship, the 'Friend Anniversary' video tends to end up feeling like a severely misjudged attempt to coax you into a bit of a nostalgia-cry, especially when half the pictures which show up don't even feature the people in question. On Thursday, they unleashed the latest weapon in their campaign to make us all associate Facebook with the true meaning of friendship. 'Friends Day' isn't any more a real holiday than 'Love Day' was in that episode of The Simpsons, and it's no less saccharine. Facebook could have just gotten away with riffing off another highlight reel of old photos, but instead they opted to create a horrifying monster and then unleash it upon our news feeds. A swarm of familiar profile pictures and reaction symbols, smashed together in the vague shape of a humanoid and then tasked with dancing around like a rhythmically challenged yeti. What makes it so much worse is that you're actually seeing pictures of your loved ones acting as body parts - head, hands, shoulders... crotch. 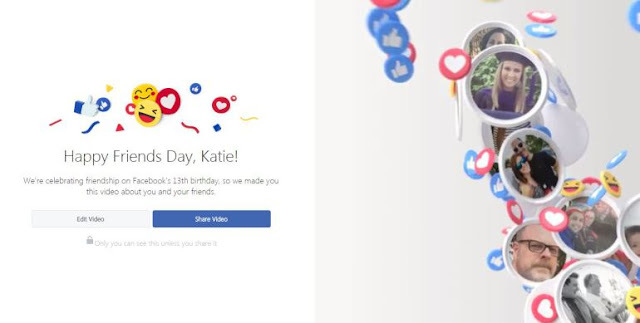 Facebook originally concocted Friends Day to mark their launch anniversary, but this year they were 2 days early, so I guess they've just decreed that Friends Day is its own thing now. Friends Day Community Event from Facebook on Vimeo. As well as summoning atrocities from the depths of the fifth dimension, Facebook also held a special event at their headquarters at Menlo Park, inviting various people to speak about how Facebook has helped them to do inspirational things. I can't really make fun of that, it was a nice thing for them to do, as you can see in the video above. More friendship related content is expected to come out for the next few days, although it's unclear exactly what. At least we can rest easy knowing that it couldn't possibly be more terrifying than the Friendship Demon.